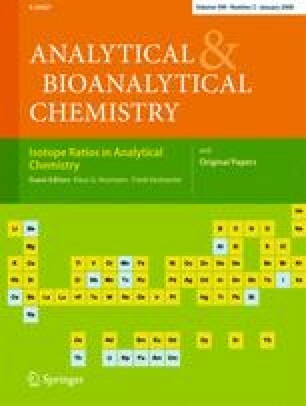 This paper presents the application of a multicollector inductively coupled plasma mass spectrometer (MC–ICP–MS)—a Nu Plasma HR—equipped with three ion-counting multipliers and coupled to a laser ablation system (LA) for the rapid and sensitive determination of the 235U/238U, 236U/238U, 145Nd/143Nd, 146Nd/143Nd, 101Ru/(99Ru+99Tc) and 102Ru/(99Ru+99Tc) isotope ratios in microsamples collected in the vicinity of Chernobyl. Microsamples with dimensions ranging from a hundred μm to about 1 mm and with surface alpha activities of 3–38 mBq were first identified using nuclear track radiography. U, Nd and Ru isotope systems were then measured sequentially for the same microsample by LA–MC–ICP–MS. The application of a zoom ion optic for aligning the ion beams into the ion counters allows fast switching between different isotope systems, which enables all of the abovementioned isotope ratios to be measured for the same microsample within a total analysis time of 15–20 min (excluding MC–ICP–MS optimization and calibration). The 101Ru/(99Ru+99Tc) and 102Ru/(99Ru+99Tc) isotope ratios were measured for four microsamples and were found to be significantly lower than the natural ratios, indicating that the microsamples were contaminated with the corresponding fission products (Ru and Tc). A slight depletion in 146Nd of about 3–5% was observed in the contaminated samples, but the Nd isotopic ratios measured in the contaminated samples coincided with natural isotopic composition within the measurement uncertainty, as most of the Nd in the analyzed samples originates from the natural soil load of this element. The 235U/238U and 236U/238U isotope ratios were the most sensitive indicators of irradiated uranium. The present work yielded a significant variation in uranium isotope ratios in microsamples, in contrast with previously published results from the bulk analysis of contaminated samples originating from the vicinity of Chernobyl. Thus, the 235U/238U ratios measured in ten microsamples varied in the range from 0.0073 (corresponding to the natural uranium isotopic composition) to 0.023 (corresponding to initial 235U enrichment in reactor fuel). An inverse correlation was observed between the 236U/238U and 235U/238U isotope ratios, except in the case of one sample with natural uranium. The heterogeneity of the uranium isotope composition is attributed to the different burn-up grades of uranium in the fuel rods from which the microsamples originated. The online version of this article (doi: 10.1007/s00216-007-1575-6) contains supplementary material, which is available to authorized users. The authors acknowledge financial support from the Austrian Science Fund FWF (START project 267-N11).